Davis is also more involved as a pass catcher, which we can see from the significantly lower ratio of runs/pass targets. To put this in easier to digest numbers, Davis saw 42 targets in less than 400 snaps, while Howard saw 26 targets in over 600 snaps. 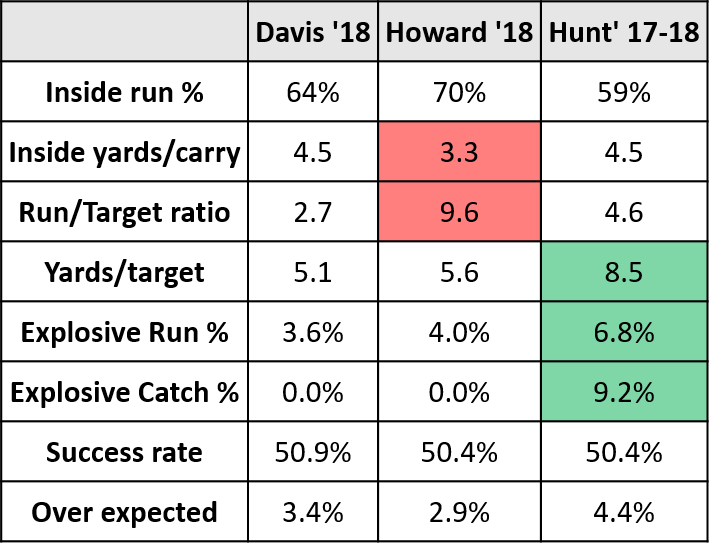 Davis’ target frequency numbers are more in line with Kareem Hunt’s, but his yards/target numbers are more similar to Howard, which is not ideal. This suggests he doesn’t get targets downfield, but only catches dumpoffs. Still, his availability to catch dumpoffs more regularly than Howard is helpful in avoiding offensive predictability. According to The Quant Edge, Seattle ran it 45% of the time when Davis was on the field and 60% of the time when he was not on it. This 15% swing is smaller than the Bears saw in 2018 with Howard (57% on, 33% off, 24% swing) or Tarik Cohen (36% on, 56% off, 20% swing). Hopefully Davis’ presence on the field can help make the offense a bit less predictable. One area where neither Howard nor Davis did very well is at making explosive plays. Here we can see they are both deficient compared to Kareem Hunt, both on the ground and through the air. Considering the importance of explosive plays to offensive success, this highlights Davis’ shortcomings, and why the Bears are likely hoping Davis ends up in a situational role, not playing 600+ snaps like Howard did last year. If Davis can translate his 2018 performance to Chicago, he’s an upgrade over the Jordan Howard we saw in 2018, but the Bears will need to find a lead running back in the draft who can beat out Davis fairly quickly if they want the offense to fully realize its potential. While Davis might not provide the explosive plays Chicago needs, new WR/RB/KR Cordarrelle Patterson should help in that regard. A few weeks ago I highlighted the need for Chicago’s role players to produce more explosive plays. Players outside of the main group of Jordan Howard, Tarik Cohen, Allen Robinson, Taylor Gabriel, Anthony Miller, and Trey Burton saw 103 combined carries and targets in 2018 and produced 6 explosive plays. Patterson saw 70 carries + targets and produced 9 explosive plays. He won’t be a main offensive contributor – he only played 230 snaps in New England last year – but Patterson’s ability to change the game on one play shouldn’t be overlooked. Defenses will have to respect the threat he provides much more than it did guys like Taquan Mizzell and Josh Bellamy. Here’s a great video from Jack Soble of The Loop Sports highlighting how Patterson’s ability to run jet sweeps effectively can help the offense. And of course Patterson’s kick return abilities will provide value as well. Patterson is one of the best kick returners in the NFL, and that is an area where the Bears really struggled in 2018. The upgrade there can be seen in the table below. Patterson averaged almost 10 yards/return more than the Bears last year, and because of him New England’s average starting field position after a kickoff was 2.5 yards better than Chicago’s (even after accounting for the fact that the majority of kickoffs these days result in touchbacks). The biggest difference was in how frequently the offense would start in positive field position. Bears’ kickoff returns only set the offense up outside of the 30 twice, while New England started there 10 times thanks to Patterson. Patterson won’t play a ton of snaps or get consistent touches, but his ability to break a big play either through returns or on offense will absolutely make a big impact on 2 or 3 games this year. Bears fans can only hope one of them comes at a timely moment in the playoffs. In terms of specific players, Patterson will fill some of the void that Josh Bellamy leaves behind at wide receiver. Bellamy played 321 snaps on offense in 2018, and I expect Patterson will fill most of those (though Javon Wims could take some as well). Patterson (plus improved RB depth with Davis + a rookie likely replacing Howard) also likely knocks Taquan Mizzell is off the roster, which I for one think is a bit overdue. According to Pro Football Focus, Patterson took 47 snaps at RB last year compared to Mizzell’s 40. Seeing as Mizzell averaged 1.8 yards/carry and Patterson 5.4, I’d say that’s an upgrade. One area where Josh Bellamy will not be as easy to replace is special teams, where he played 245 snaps in 2018 and has long been a mainstay on coverage units. Patterson doesn’t really play special teams outside of returning kickoffs, but newly signed WR Marvin Hall, who played 203 snaps on special teams for Atlanta in 2018, does. Details of the contract are not out yet, but I’m guessing Hall got very little guaranteed money and thus will be fighting for a roster spot in camp, as Bellamy did for many years. Hall also has a little offensive experience, as he played 185 snaps there for Atlanta in 2018 and saw 19 targets (compared to 321 snaps and 25 targets for Bellamy). I would expect Hall has a chance to earn a small role on the offense as well, and it’s worth noting he has 4 explosive plays on 30 career carries + targets, so he might be able to give the Bears a big play or two as well. That is possible because the trait that defines Hall is speed; he ran a 4.28 40 yard dash at his pro day in 2016. 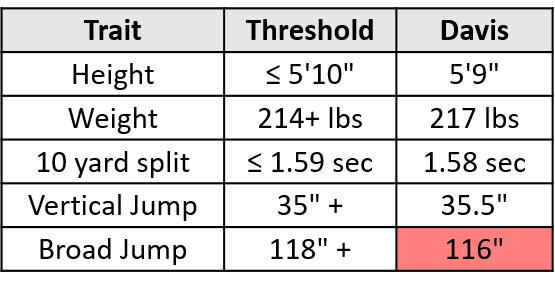 This small, fast WR seems to be something of a type for the Bears, as they brought in Taylor Gabriel last offseason and have now taken flyers on Hall and Cyril Grayson, a former track star who ran a 4.33 40 at LSU’s pro day in 2017. The odds of Hall or Grayson developing into much of anything on offense are slim, but it does make me wonder if the Bears are preparing for the possibility of life after Gabriel should he be a cap casualty following the 2019 season.